In the face of unprecedented disruption more businesses are looking for new ways to leverage data and analytics in the cloud to stay relevant and competitive. 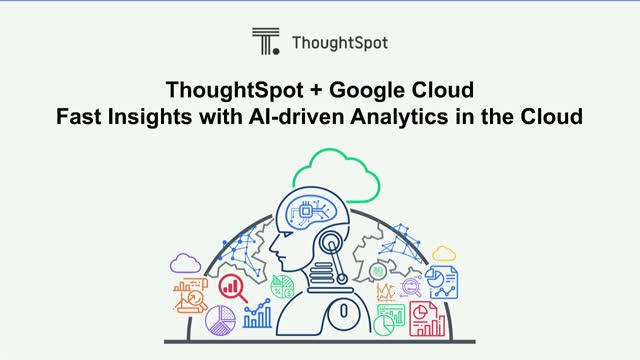 ThoughtSpot on the Google Cloud Platform lets companies reap the benefits of fast search and AI-driven insights in the cloud. Doing so enables anyone, regardless of technical sophistication, to quickly extract ML-derived insights from Google Cloud ML Engine using a simple search to go from answers to predictions in a single click. For years, analytics vendors have helped enterprises understand what’s happening in their business, yet often failed at answering the more valuable question of why it’s happening. Everyone expects to have data to understand what’s happening it their business. When it comes to understanding why that’s happening, it’s a completely different story. People don’t even know what questions to ask to begin answering that question, slowing down decisions and stifling business growth. With AI-driven analytics, that’s all about to change. SpotIQ, the AI engine from ThoughtSpot, asks thousands of questions and automatically shares relevant, customized insights buried in your data. Business users can get to the heart of why changes are happening to make decisions with confidence. The pace of innovation in analytics has hit breakneck speed. Technologies like AI, natural language processing, and voice-driven analytics make it easy for insights-driven businesses to harness insights from data to operate smarter and faster in a fast-moving competitive environment. Turning these data-driven insights into action fuel an organization’s intelligence to improve customer experience, streamline operations and drive growth. And the payoff is immense. According to Forrester Research, insights-driven businesses grow on average 30% year-over-year, seven to ten times faster than the global economy1. Join ThoughtSpot and guest speaker, Forrester Research VP and Principal Analyst Boris Evelson to learn how to transform your organization into an insights-driven business by letting business users uncover actionable insights in a whole new way using search and AI. Today every industry is feeling the effects of the Digital Transformation brought about by disruptive technologies like the AI, Cloud, Internet of Things, Blockchain, and Microservices. While some enterprises are already benefiting from these new technologies, many are overwhelmed and struggle to transform all of these new digital signals into business value. Work management is often an uphill battle for many utilities providers. The costs of deploying workforce last minute are exorbitant, the field distribution data lives in multiple inaccessible systems, and the data teams supporting the field often spend too much time creating reports which don’t deliver the ad-hoc insights they need to succeed. How can we sensibly remove the friction caused by outdated technology, poor data visibility, and improve smarter field deployment? In this webinar, you’ll learn how to stay ahead of the competition with a smarter approach to your data and work management issues using the power of search and AI-driven analytics. Artificial intelligence stands to make the most significant impact on the global economy of any technology in the last century, adding $15.7 trillion to the economy. In analytics alone, AI is expected to create nearly $6 trillion in revenue. But that raises some serious questions. How exactly is AI going to change BI? What do data professionals need to know to stay ahead of the curve? What will the economy look like in world powered by AI-driven analytics? On a daily basis the healthcare industry generates troves of data including everything from insurance claims, hospital operations, electronic medical records to even patient sentiment. Within this data lies answers to crucial questions that can improve financial performance, operational management, and most importantly, patient outcomes. Yet for most professionals within the industry, it’s a daily struggle to get access to the information they need fast enough to make a difference. Static reports with stale data aren’t sufficient for making data-driven decisions, especially when they affect patient outcomes. Search and AI-driven analytics is vastly expanding the reach of data-driven insights by bringing ad-hoc data access to the masses. Anyone can easily find answers to their data questions, including those questions they may not have thought to ask. Tune in to this live webinar as we show you what it’s like to be your own data analyst with advances in Search and AI-driven analytics. Artificial Intelligence is a transformative capability that promises immense business potential—especially when infused in data analytics. Join ThoughtSpot to learn best practices for leveraging AI as a key enabler for analytics. We’ll discuss how to best understand and manage the potential opportunities and risks involved. The retail landscape is changing rapidly. In the face of unprecedented digital disruption more businesses are looking for new ways to leverage data and analytics to stay relevant and competitive. Join Sean Zinsmeister, ThoughtSpot’s Head of Product Marketing, for a live webinar to learn how merchants can answer their own ad hoc questions instantly without the help of data experts using Search & AI-Driven analytics. Data is the lifeblood of every modern organization. Making it available throughout an organization can be a game-changer, yet the vast majority of frontline workers have very little experience in using data as the primary vehicle for decision making. Join Doug Bordonaro, ThoughtSpot Chief Data Evangelist, for a live webinar to learn tips and best practices for setting up every employee for success with data. Sterling Talent Solutions, the world's largest background screening provider performs over ten million background checks a year. This ultimately left the firm with millions of transactional events that need to be trove through to conduct analysis and insights into how their product and performance is delivering for customers. In the past, the team went through an expert reporting team where everything lived in Excel. With only a small group of data experts to service the business users, the results were a massive backlog and long waiting time for managers who needed answers. To solve this challenge, Sterling turned to search-driven analytics which gave non-technical business users the ability to answer ad-hoc questions fast – helping reduce their BI backlog by 60%. Augmented analytics, a new class of technology that includes search, natural language processing and generation, along with AI-driven automated insights, helps companies achieve unprecedented speed to insights. No more waiting days or weeks for an answer, and more importantly, no more decisions made from your gut. Join the ThoughtSpot Product team to learn how augmented analytics is permeating the analytics landscape and see how SpotIQ delivers augmented insights to business people at human scale. Enterprise data is complex, but asking ad-hoc questions of your data shouldn’t be. That’s why we built the world’s most advanced analytical search engine to make it easy for any business person to query complex data models and get 100% accurate results - all in seconds. Join CTO and co-founder Amit Prakash in a live webinar for a look at how ThoughtSpot’s Relational Search Engine enables true self-service analytics by translating simple searches into complex queries on some of the most complex database schemas. SpotIQ is an AI-driven analytics engine that uses supervised machine learning to automatically generate personalized insights. Powered by ThoughtSpot’s in-memory calculation engine and dozens of insight-detection algorithms, SpotIQ delivers insights to any business person - all with a single click. Join ThoughtSpot and Eckerson Group as we cover best practices on transforming data into a revenue-generating asset. Join ThoughtSpot and Forrester Research Principal Analyst, Martha Bennett, to learn best practices for leveraging AI as a key enabler for analytics. We’ll also discuss how to best understand and manage the potential risks involved. Tune in for the latest in search-driven analytics, business intelligence, and big data.